The Board Certified Atlas Orthogonist is a licensed Doctor of Chiropractic who utilizes a light-force method of specifically adjusting the spine. The Atlas Orthogonist chiropractor has undergone extensive training specializing in correcting spinal misalignment by using the atlas orthogonal percussion instrument. This method is gentle and effective and requires post-graduate training. The Atlas Orthogonal system is a painless and safe spinal correction which restores body balance and increases the body's natural healing ability. Coron Family Chiropractic uses the Atlas Orthogonal system of health care as the foundation when caring for our patients. This precise form of upper-cervical spinal correction painlessly restores body balance and reactivates the body's natural healing abilities. The actual adjustment is performed on a specific table which uses six pounds of percussive force to perform the adjustment and precisely realign the atlas vertebra within its normal range of motion, removing irritation from the brain stem. This means you will feel no twist, pop, or pain while the adjustment takes place. In the adjusting head of the instrument, there is a solenoid that strikes a stylus. The stylus does not move, but allows for percussion to be transmitted through the tip. The tip is placed over the side of the first vertebra (the atlas bone), and the percussive force moves the vertebra in the desired direction, based on the coordinates set by the doctor. The reason the atlas is so important is because it is at the level of the brain stem where there are 78 trillion nerve fibers passing through this area. The atlas is the first bone of your spine, with the head sitting on top of it and the rest of the spine aligning below it. Numerous anatomical structures pass through this junction, including the vertebral artery which supplies blood to the brain. 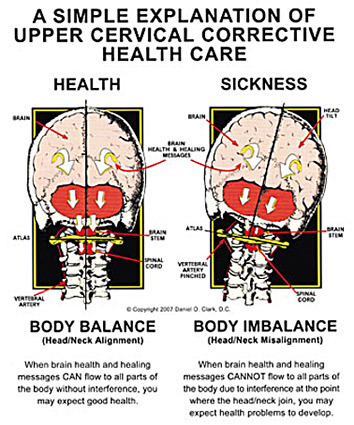 After an atlas adjustment, we expect increased blood flow to the brain and cerebrospinal fluid in the body. Manual adjustments are generally what a person thinks of when they consider what a traditional chiropractor does. A chiropractic adjustment is the use of a specific force in a precise direction that helps normalize spinal function to restore the body's natural healing ability. Adjustments help normalize spinal function and avoid bone and soft tissue degeneration. Adjustments relieve irritation of the nerves which control your organs. When nervous system function improves in this way, the body can begin the natural healing process. Soft tissue injuries are becoming more prevalent. People also generally refer to soft tissue injuries as scar tissue build up, myofascial release, or muscle adhesions. Soft tissue mobilization techniques can help you enjoy life activities again whether the injuries are chronic, acute, or post-surgical. The non-invasive technique uses specially designed stainless steel instruments to help the clinician identify and treat areas exhibiting soft tissue fibrosis or chronic inflammation. These techniques address scar tissue and fascial restrictions during rehabilitation and help to administer effective range of motion maintenance programs. As the instruments are moved over the affected area and meet the adhesions, they help break up scar tissue and fascial restrictions. In time, this process will reduce or eliminate the adhered fibers, restoring range of motion and eliminating the associated pain. It will help transform your soft tissue injury into healthy functioning tissue. Soft tissue mobilization is one of the most effective treatments for rehabilitation and range of motion maintenance. Soft tissue mobilization is utilized not only for elite athletes but everyday patients. Patients usually receive two treatments per week during a four week period. Most patients have relief by the third or fourth treatment. Coron Family Chiropractic and thousands of other Chiropractors around the world now use the Impulse Adjusting Instrument® in the care of their patients. This patented and FDA registered device was specifically created to deliver gentle and precise chiropractic adjustments to the joints of the spine and extremities to relieve pain and restore function. The Impulse Adjusting Instrument® is controlled by micro-computer circuitry housed within the device that produces a controlled force that chiropractors can use to treat different areas of the body. Impulse adjusting is a new technique developed to provide controlled treatments to the specific areas you’re having trouble with. Impulse adjustments are high-tech. There is no popping or cracking with these adjustments, but rather very precise and targeted adjustments designed to specifically care for just the right areas. Years of research have gone into the development of the Impulse Instruments to create gentle chiropractic adjustments that are safe and effective for patients of all ages. The Activator Method® technique is a gentle, low-force approach to chiropractic care. Some patients favor the Activator Method because of the gentle nature of this technique without the traditional “popping” or “cracking.” Activator Method® offers a unique system of administering spinal adjustments using research-based analysis, and the activator adjusting Instrument can help restore spinal balance safely and comfortably. The technique utilizes specific protocols to detect spinal joint dysfunction, analyze leg length inequality, identify issues with body mechanics, and test neurological reflexes. Because of its effectiveness and gentle nature, the Activator Method® has grown to become the world’s most widely used instrument chiropractic technique. This unique hand-held instrument has been studied extensively with results published in hundreds of peer-reviewed research papers and was designed to give patients a specific and gentle adjustment. The activator adjusting instrument allows patients to receive reproducible and effective adjustments. The activator provides a controlled, fast thrust that is comfortable for the patient. Patients of all ages can enjoy the benefits of an activator adjustment. The technique is especially helpful for children who sometimes have trouble laying still. The activator adjustment is quick and comfortable. Older patients, or those with arthritis, osteoporosis, or other bone-weakening conditions find the Activator Method® to be effective and gentle. The low-force thrust of the activator adjusting Instrument and the doctor’s ability to pinpoint the exact location of the problem through activator analysis, can relieve a patient’s pain without discomfort. Though some believe that chiropractic care is intended to relieve neck and back pain, this form of therapy has more far-reaching benefits. A wide variety of health problems stem from spinal imbalance and dysfunction of the spinal joint and nervous system. Everyday living, stress, and old injuries can cause vertebrae to lose their proper motion. This dysfunction can irritate your nervous system, causing pain and nerve interference throughout the body. By restoring spinal balance, chiropractic care aids the body in healing itself, and the Activator Method® chiropractic technique accomplishes this goal through safe, effective, and gentle low-force adjustments. At Coron Family Chiropractic, we believe so strongly in the benefits of chiropractic care for babies and children that we dedicated an entire room to treating our very young patients. Throughout pregnancy, birth, and childhood, chiropractic can provide various health benefits. Pediatric and child chiropractic creates a foundation for healthy, growing kids. Healthy kids grow into healthy adults. Pain and symptoms are not required for there to be nerve interference. Children go through this critical development physically and neurologically from a young age. A child’s spine grows almost 50 percent in length during the first year. Chiropractic care offers benefits to their health and prevents issues from developing. Your child is never too young to bring to the chiropractor. Moms often bring their children in the first week they born. They continue throughout childhood, as children tend to have numerous falls or tumbles daily. Infants only require a very minimal amount of pressure to make spinal adjustment. Chiropractic care can also help with emotional and behavioral issues. This works by balancing the parts of the nervous system commonly referred to the flight or fight response. Removing the interference from the nervous system allows the proper level of hormones and the proper balance of the fight or flight response. We provide various brands of health supplements including Ortho Molecular, Standard Process, and Nutri-Dyn (Metagenics.) These brands can cover all your supplements needs from every day use to purification and detox programs. These brands offer the best products available from infant to geriatric needs. These supplements are third-party tested, so you know that you are getting exactly what the bottle says for potency. These supplements are the purest form, creating pharmaceutical-grade products. The reason Dr. Coron prefers these brands is because you know with certainty exactly what you are receiving.